I am always very ambitious about my summer reading list and I always start out very strong. The problem is that by the middle of the summer I’ve added books not on the original list. For example, today I stopped into Barnes and Noble to pick up Lord of the Flies by William Golding. I’m not really sure why I must read that book NOW but I am guessing it has something to do with my son’s sleepaway summer camp experience and the photograph of him with war paint on his face and painted handprints on his stomach. Go figure. Simple, right? It’s only one more book, right? Wrong, because I also picked up two more books, A Game of Thrones by George R.R. Martin (I’ve seen two random episodes of the HBO mini-series and I am intrigued, besides I’ve heard good things) and Why Jane Austen? by Rachel M. Brownstein. 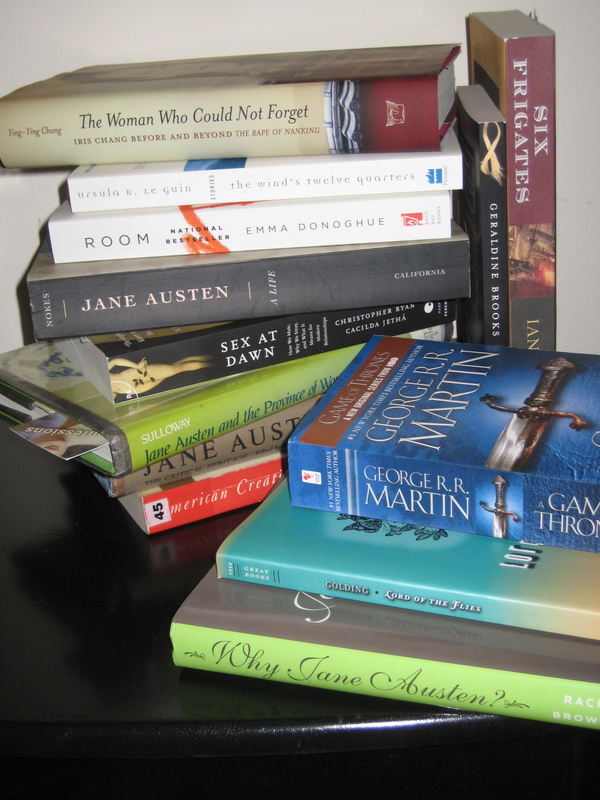 The latter is because I am Jane Austen obsessed and I just cannot pass up any new book about her. So in addition to my three latest acquisitions, here’s the rest my summer book list (this does not include the books I’ve actually read) which I will not be able to finish before the end of summer. I think I need a 12 step program for book addiction. Borrow away! I won’t get to them anytime soon. Agree with you about Chang, the world has lost a very talented historian. My Dad recommended Six Frigates to me and coming from a retired sea captain that’s praise indeed. Fine information and facts! I have been searching for things such as this for quite a while these days. Thank you!